A revolutionary hair treatment service that was originally developed in Brazil, Trichovedic HydroSpa Keratin Smoothing Treatment infuses and bonds Keratin, Wheat and Rice Proteins into and onto the cuticle layer of the hair shaft. Combined with amino acids, silicones and anti static agents, the results are quite simply remarkable; incredible shine, smoothness, enhanced strength and condition, frizz free and humidity proofed. The hair is straightened around 90% giving it a far more natural look than chemical straighteners and the hair is in better condition than when you started. Incredibly, the treatment works more effectively the more damaged the hair is. Unlike chemical straighteners HydroSpa Keratin Smoothing Treatment does not chemically rearrange the internal disulphide bond structure of the hair and it can be used on coloured, foiled and chemically straightened hair. The Trichovedic HydroSpa Keratin Smoothing Treatment takes will take between 1.5 to 3 hours depending on hair length and density. The hair is first shampooed with a special deep cleansing shampoo and then blowdried 100% dry. 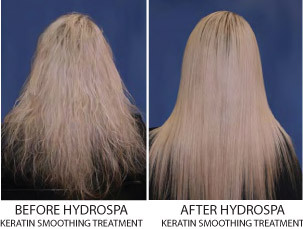 The HydroSpa Keratin Treatment is then applied to the hair in fine sections and then left on the hair for approximately 15 minutes. We then blowdry the Keratin into the hair in preparation for the straightening process. The straightening process is done with special Keratin Irons designed for the service and is the most time consuming part of the service. Once the ironing process is complete the hair is left to rest for up to 15 minutes. The hair is then shampooed with specific Trichovedic sulphate and sodium chloride free shampoo and followed with a Trichodevic Hair Masque. We can then trim the hair, if required. Last step is to blowdry your hair and then you will be amazed with the result! You may shampoo your hair at home as soon as you wish to – No Need to wait 72 hours as with some other Keratin Treatments. Correct aftercare of HydroSpa Keratin Treatment is absolutely essential for the optimum quality, integrity and longevity of the treatment. After Care shampoos, conditioners, treatments, serums and styling aids should be FREE of SULPHATES and SODIUM CHLORIDE (salt) as these chemicals will degrade and remove the Keratin bonded to the cuticle layer of the hair. The majority of salon shampoos contain sodium or amonium lauryl sulphate and many of them also contain sodium chloride. Trichovedic has the most comprehensive and prescriptive range of Keratin Smoothing Treatment After Care products available which are Sulphate and Sodium Chloride Free. A haircut can be conducted immediately after the Treatment; colouring and foiling are best done immediately prior to the Treatment or at least two weeks afterwards. How long the Treatment will last? Between three and five months. A repeat Treatment can be conducted after three months or as required. For clients with this type of hair who want a really straight result, consideration should be given to conducting a traditional chemical straightening service first immediately followed by a HydroSpa Keratin Treatment. A hypoallergenic, coloursafe, sulphate and sodium chloride free luxury shampoo which is particularly suitable for sensitive skin/scalp and for after care of HydroSpa Keratin Smoothing Treatments. Formulated from natural glucose and coconut oil derivitives and infused with SWS TriProtein Complex, jojoba and macadamia oils, shea butter, aloe vera and panthenol. HydroSpa Luxury Shampoo will gently cleanse, restore moisture and shine and act as a precursor for the conditioning process. pH 6-7 Gently lather a small amount into wet hair. Rinse out and repeat if necessary. Follow with HydroSpa Treatment Conditioner. A rich instant acting treatment conditioner for dry, damaged and coloured hair and for after care of HydroSpa Keratin Smoothing Treatments. Infused with SWS TriProtein Complex, jojoba and macadamia oils, shea butter, aloe vera and panthenol. HydroSpa Treatment Conditioner will restore and maintain shine, strength and elasticity. pH 3.5-4 After shampooing with HydroSpa Luxury Shampoo, distribute through the hair with a wide tooth comb. Leave 1-2 minutes and rinse out. Infused with the highest concentration of SWS TriProtein Complex, jojoba and macadamia oils, shea butter, aloe vera and panthenol. HydroSpa Deep Therapy Treatment Masque is a rich, intensive treatment which will transform the condition of dry, damaged and coloured hair and maintain the integrity and longevity of HydroSpa Keratin Smoothing Treatment. pH 3-3.5 After shampooing with HydroSpa Luxury Shampoo towel dry hair and gently massage through. Leave 5-10 minutes and rinse out. A rich, leave-in moisturiser that will transform and de-frizz dry, damaged and coloured hair and maitain the ultra smooth finish of HydroSpa Keratin Smoothing Treatment. Infused with SWS TriProtein Complex, jojoba and macadamia oils and with higher concentrations of shea butter, aloe vera and panthenol for superior moisturising and de-frizzing. pH 4-4.5 Work a small amount throug dry hair and leave in and style as usual. A hypoallergenic, sulphate and sodium chloride free shampoo formulated to stimulate and promote scalp health, alleviate dry flaking scalp and for after care of Keratin Smoothing Treatments. Formulated from natural glucose and coconut oil derivatives and infused with SWS TriProtein Complex, sage, tea tree oil, nettle and peppermint oil. Spa Therapy Hair + Scalp Shampoo will leave the scalp in an aseptic condition and will stimulate blood flow. pH 6-7 Gently lather a small amount into wet hair. Rinse out and repeat if necessary. Follow with SpaTherapy Hair+Scalp Rinse. A conditioning rinse which will detangle, add shine and condition and provide after care for Keratin Smoothing Treatments. Infused with SWS Triprotein Complex, sage, tea tree oil, nettle and peppermint oil. SpaTherapy Hair + Scalp Rinse will leave the scalp in an aseptic condition. pH 3.5-4 After shampooing with SpaTherapy Hair+Scalp Shampoo apply and massage through the hair and scalp. Leave 2-3 minutes and rinse out. Infused with SWS TriProtein Complex, sage, tea tree oil, nettle and peppermint oil, SpaTherapy Hair + Scalp Treatment Masque is an intensive treatment for the hair, will leave the scalp in an aseptic condition and will stimulate blood flow. It will transform the condition of dry, damaged and coloured hair maintain the integrity and longevity of Keratin Smoothing Treatments. pH 3-3.5 After shampooing with SpaTherapy Hair+Scalp shampoo towel dry, apply through hair and scalp and massage scalp for 5-10 minutes and rinse out.